All puppies are cute. Keeping that in mind, we must also understand that all puppies have the same basic needs. Food, water, socialization, immunizations, a place to sleep they can call their own, and of course lots of love will satisfy most of your puppies needs. During the first two years of life a puppy is changing all the time. At first you will notice how quickly they are growing and seem to get bigger every day. As they get older they will look like an adult but there are still many changes taking place. The most important thing you can do to facilitate the growing process is to feed a high quality food. It is important for growing bones and ligaments. When you select your dog food remember that you get what you pay for. There is nothing more important to your dogs good health than nutrition. A premium dog food is worth it’s weight in gold. Beware, not all dog foods are created equal. Your most important tool in selection of dog food is the label but they can be quite confusing. Therefore, we will try to make this simple so you have some idea of what you are buying. The first rule is to understand the terms by-products and meal. As an example, if you see the product contains chicken meal, that means the whole chicken was processed and contains everything. If the label says chicken by-products then that means it is mostly feathers, beaks, feet, and other parts of little value. In short, meal is better. The next thing to remember is to avoid corn. If the word corn appears in the first three ingredients on the label, find another brand. Corn is used as a filler and makes the dogs feel full. Unfortunately, it has little nutritional value for canines. Ingredients on the label are listed in descending order of percentage in the food. In other words, if chicken is the first ingredient listed then it has the highest percentage in the food. The next ingredient has the second highest percentage, and so on. The better the dog food that you feed means that you don’t have to feed as much to achieve the required nutrition. It also means there is less to pick up after your dog removes the nutrients. That’s always a plus. Of course you want to keep your puppy healthy and there are many ailments specific to canines. You need to establish an immunization protocol for the good health of your puppy. We won’t try to suggest what shots to give your puppy here but we will urge you to consult with your veterinarian on the latest data for immunizations. While many immunizations are given yearly, the latest research indicates that some vaccines may not be necessary on a yearly basis and may in fact cause problems if given too often. 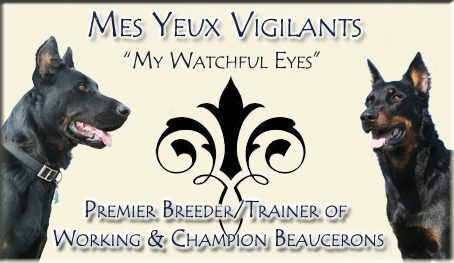 Beaucerons have strong personalities and can be your best friend or worst nightmare. From day one your puppy should not have any doubt as to the one in charge of the pack. The pack leader is always the first one to eat dinner. The pack leader always goes first. The pack leader gets the best sleeping spot. The pack leader corrects unacceptable behavior. The pack leader sets the example. I will try to explain why all this is important to you and your new puppies home life. The first concept to being the pack leader is controlling the food bowl. Your Beauceron should be fed twice a day and it should be fed by the pack leader. Simply putting the bowl down on the floor in the in the morning full of food and allowing the dog to eat whenever hungry is not a good idea. The pack leader gives food and removes anything left after 15 minutes. Starting with this from a puppy prevents the dog from protecting it’s bowl and biting people and young children if they get too close. Your dog must be subordinate to all people in your household. It is never a good idea to feed scraps at the table or human food at any time, unless you prefer your dog to beg and pester you while eating. A pack leader goes out the door first when going for a walk. That means your dog should wait for you to go outside and then be invited out to join the pack leader. A pack leader goes up to strangers with confidence and does not allow the subordinate dog to hide behind them or avoid strangers. This gives the dog confidence around strangers and helps to prevent shyness and fear biting. Remember that a pack leader sets the example. Do not allow your dogs shyness and what ever you do, don’t baby talk to them. Baby talk reinforces the behavior they are demonstrating and if that’s shyness then you will always have a shy dog. Plan to spend lots of time in the park and other populated areas allowing your dog to meet and greet other people. It’s also important that they meet other dogs as well. Your dog need it’s own place to sleep and that doesn’t mean the bed with you. A pack leader gets the choice spot to sleep and the puppy does not get put on the same social level as the pack leader. A crate with some padding is an excellent choice for a place the puppy can sleep. A puppy will naturally not want to soil it’s sleeping quarters. Therefore, they try to hold it and will often whine or cry when they need to go out. This helps in house breaking. Wolves (which is where all dogs came from) dig dens in which to sleep and rear their young. They actually like to feel enclosed in a safe comfortable area. Crates can provide this comfortable area and also keep them out of mischief like chewing shoes and getting into pesticides. As the dog gets older they often prefer to sleep in their crate even with the door left open. Spend time with your new puppy. They just left their mother and are in a strange new place. They need to feel comfortable and wanted. The faster you establish yourself as pack leader the more comfortable they will feel. The more time that you spend with your dog the more they will feel a part of the family. And don’t forget they are a part of your family. Too often dogs end up at the shelter and put to sleep because the pack leader moved or had some other change that made the dog inconvenient. A dog is for life and not just while they are a puppy. Make your new Beauceron puppy a family member and they will reward you with a lifetime of loyalty and joy. This entry was posted in Beauceron Care on January 15, 2017 by myvbeauces.